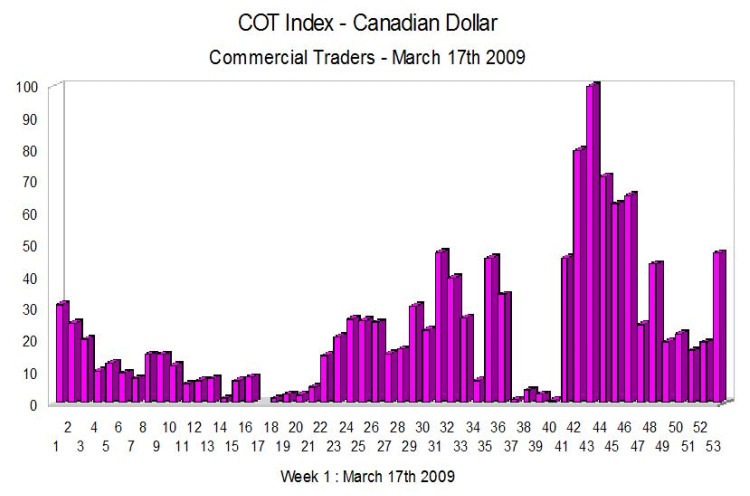 The COT index for the Canadian Dollar is extremely interesting on several levels and in particular teaches us an important aspect of the patience required when interpreting the chart. A quick comparison between the COT data and the spot market chart for the usd/cad highlights the fact that for the last 3 to 4 months we have seen sideways consolidation in the spot market with futures positions being built up at an extreme of the index. It is clear from the COT chart that we are going to see a strengthening of the Canadian Dollar at some point but what is less clear is the actual timing of this event and as we can see we have had to wait several weeks for this view to emerge. With the data now rising and seeming to build away from the extreme of the last 2 to 3 months we may finally be seeing the strengthening of the Canadian Dollar that has been threatening to take hold for some time. In the spot market this has been translated into several failed attempts by the US dollar to penetrate the 1.3 region and more recently this has been coupled with a series of bearish signals. So combining our spot market analysis with the COT index confirms the view that longer term we will see US dollar weakness and Canadian Dollar strength return. All the latest fundamental news is now available on the economic calendar.